Prior to his appointment at Case, where he served as the first permanent chair of the Department of Cognitive Science, Merlin Donald was professor of psychology and education at Queen's University, Kingston, Ontario, Canada. 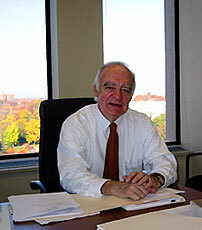 A cognitive neuroscientist with a background in philosophy, Donald did his early empirical work in the field of human cognitive and clinical neuroscience. He is currently trying to understand how the slow-moving biology of the brain can deal with the changing cognitive ecology. Humanity is greatly concerned about changes in the physical ecology, but has largely ignored equally massive changes in the cognitive ecology, even though the latter will probably set our future direction as a species. During the past 15 years, he has returned to the topic that first drew him to psychology. This work bridges several disciplines in the sciences, social sciences and humanities. His central thesis is that human beings have evolved a completely novel cognitive strategy: brain-culture symbiosis. As a consequence, the human brain cannot realize its design potential unless it is immersed in a distributed communication network, that is, a culture, during its development. The human brain is, quite literally, specifically adapted for functioning in a complex symbolic culture. Where would these complex communication networks have come from in the first place, if they were largely absent in our ancestors, the Miocene apes? This question was first addressed in his first book, Origins of the Modern Mind: Three Stages in the Evolution of Culture and Cognition, published by Harvard University Press in 1991. The central thesis of that work was that symbolic thought and language were ultimately products of changes in the primate executive brain, rather than of a specific language "chip." These changes expanded some basic attentional, metacognitive, and retrieval capacities that were nascent in primates, and highly evolved in hominids. These capacities were crucial in meeting the adaptive challenges of increasing social complexity, with an associated need for very rapid learning and an optimally flexible epigenetic strategy. This idea was further developed in a series of papers and in a book entitled A Mind So Rare: The Evolution of Human Consciousness (W. W. Norton, April, 2001).